Green Day's out on tour ("99 Revolutions") supporting their three latest albums '¡Uno! ', '¡Dos! ', '¡Tré!'. 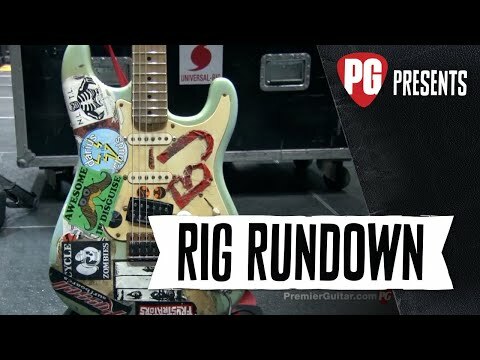 Premier Guitar's Chris Keis caught up with Green Day's guitar and bass techs for a detailed run through of their guitar rigs. In the video below [at 17:29] Jason White's guitar tech explains Jason's guitar rig which includes our Chandler Limited Little Devil Colored Boost pedal. The Chandler Limited Little Devil Colored Boost guitar pedal was also used in the recording of the '¡Uno! ', '¡Dos! ', '¡Tré!' albums along with other Chandler Limited recording gear, including the Germanium Pre Amp/DI, TG Channel MKII, and TG2 Pre Amp/DI microphone preamplifiers. Checkout Green Day's latest records ['¡Uno! ', '¡Dos! ', '¡Tré! '], and go see them live!